If you are looking for gift ideas for him this holiday season or for an upcoming birthday, rest assured that VaporFi has the perfect collection of rugged devices made for the hard-working man. We also have some hearty tobacco e-liquid flavors and some ultra-powerful devices for those with a competitive spirit. Let us help you take care of the man in your life with our top-selling vape gifts today. Often, men are labeled as notoriously difficult to shop for – a humorous stereotype that might not be entirely undeserved. Wives, girlfriends, moms, and sisters alike joke about undertaking the challenge of gift giving to the men in their life, and countless t-shirts, coffee mugs, and ties stack up every birthday, Father’s Day, and holiday season. Luckily, if your man is a vaper, you’re working with a major advantage. With an array of fun products that can upgrade his vape experience, there’s plenty to choose from when you’re on the hunt for that perfect gift. Whether your man is a vaping veteran or new to the hobby, the right vape gift will make their day. At VaporFi, we offer everything your man could ever need for vaping, including vape devices from the industry’s top brands, handy accessories, money-saving bundles, and literally thousands of vape juice flavor combinations. Grab a few small products for a stocking stuffer or “just because” gift or go big and get him a brand-new vape setup with everything he needs to get started. There are options at every price point and to suit every vape style, so you’ll definitely be able to find something that’s a major gift win. Here’s a useful vape gift guide to find the perfect gift for every special man in your life. Has your man been talking about dropping his old smoking habit? Maybe you’re hoping you can give him the push he needs to finally kick the cigarettes for good. Here are the top five vape gifts to help him make the switch. One of the best features of the Sigelei Fuchai Squonk 213 150W kit is its incredible versatility. For the man trying to drop a cigarette habit, the ability to customize every vape session from top to bottom will be a major attraction. The ergonomic design fits comfortably in your man’s hand for extended vape sessions, making the learning process that much more enjoyable. It’s also designed for convenient squonking, a style of vaping that’s become increasingly popular. Included in the kit is the Cubic RDA atomizer, spare parts, and a charging cable. SMOK is among the most famous vape brands in the industry, and for good reason. Their mods are beloved for their high-performance capabilities, sleek styling, and durable construction, and the X-Priv 225W is no exception. With a crystal-clear OLED display, dual-battery set-up, and max firing wattage of 225 watts, the X-Priv is a seriously impressive mod. Your man will love the precision control and protective features of this mod, keeping his vape sessions perfectly calibrated and extra safe. This starter kit pairs the X-Priv with SMOK’s highly popular TFV12 Prince tank, an excellent complement to the mod. For the man that appreciates both form and function, the Wismec Luxotic BF will check all the important boxes. The stylish exterior gives the mod a high-end look that’s backed by unbeatable performance and power. The Luxotic BF delivers 100 watts of output, with the unique ability to regulate its power output based on the battery’s current state, maximizing battery life while still balancing performance. This feature, combined with the mod’s compact size, makes it ideal for all-day, on-the-go vaping. The kit also includes the Tobhino RDA, which gives your man a squonk-friendly setup with a 2-post deck, single terminals, and a generous 6 mm deep juice well. 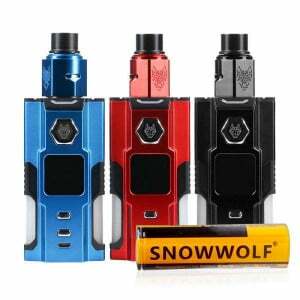 For the man that wants to deep dive into vaping with a top-quality squonk experience, the SnowWolf Vfeng BF 120W Squonk Vape Starter Kit is an excellent choice. The mod is equipped with a superior chipset, capable of firing up to 130 watts and providing temperature control settings (including TCR and TFR adjustments). Battery options are plentiful, so your man can choose his preferred battery capacity. The large 1.3” screen is full-color and beautifully brilliant, making it easy to see all the pertinent settings at a glance. This starter kit pairs the mod with the fantastic SnowWolf BF RDA. Is your man a no-frills guy that’s looking to kick his stubborn cigarette habit? The VaporFi Express Mighty Menthol E-Cigarette Kit can provide an experience that’s comparable to traditional smoking, without the harmful tar and toxic chemicals associated with old-school cigarettes. One of the highlights of the VaporFi Express E-Cigarette is its thoughtful simplicity, which doesn’t require any complicated calibrations. A satisfying vape is possible right out of the box, especially because the kit comes with 5 Mighty Menthol cartridges packed with that authentic minty taste. If your man has clocked serious vape hours, odds are he’s looking for a vape mod that can live up to his high expectations. These five mods are packed with advanced features to take his vape sessions to the next level. There’s no reason your man should have to sacrifice on performance for the sake of convenience, and the VaporFi VAIO 75 TC MOD proves it’s possible to have the best of both worlds. This all-in-one set-up features a built-in tank that perfectly complements the mod, eliminating the hassle of finding matching pieces and parts. It can run both temperature control and variable wattage coils and contains atomizers that will satisfy both mouth-to-lung and direct-to-lung vapers. Your man will be blown away by the amount of vapor produced by this mod, and you’ll appreciate the extensive safety suite that keeps both him and the vaporizer safe. With an elegant, modern design, the Joyetech ESPION 200W TC is a mod crafted for the style-conscious vaper. The Joyetech brand focused on reliability, endurance, power, and style, creating an impressive mod that is sure to please. Your man will love being able to fire up to 200 watts, all while taking advantage of a flexible resistance range (0.05 – 3.5 ohms depending on the mode), intuitive user interface, and easy-to-toggle settings. The 1.45-inch TFT color screen display is packed with all his vape data, making it easy to gauge battery, output mode, and more. Right off the bat, you’ll notice that the Sigelei TOP1 230W TC mod pulls no punches when it comes to its distinctive style. With a body design that looks like something from the future, this mod might just shock your man speechless. Once he’s taken in the gorgeous exterior, he will be thrilled with the excellent functionality and top-notch performance. Firing up the mod, he’ll experience an 800-microsecond instant output and advanced chipset, making every vape highly responsive and exceptionally fast. Full temperature control support is an option, and even the mod’s menu layout is customizable. For the vaper who marches to the beat of his own drum, the Tesla Punk 220W TC mod is a stylish device unlike anything else out there. Inspired by the steampunk revolution, the mod is a work of art that’s packed with a serious punch of power. It can reach up to 220 watts via variable power, firing impeccably with a highly advanced chipset and user-friendly design. The Tesla Punk is also 510 compatible, so you man can pair it with a wide variety of great tanks. The Sigelei SnowWolf Vfeng 230W TC mod is a high-powered vape device with futuristic flair, delivering 230 watts of variable wattage power. A unique collection of lights brightens every vape session, as does the option to choose the LED backlight color and speed. Easy navigation is made possible with the clear OLED display, offering easy access to the temperature control suite and other options. Since it’s a dual battery mod, your man can choose to pair it with 30 mm tanks and RDAs. Any vaper will tell you that the right vape tank can change your vape game completely. Give him the gift of a premium vape tank and he’ll be grateful forever – you can thank us later. The TFV8 Baby Beast Sub Ohm tank exemplifies the excellence of the SMOK brand, gifting your guy with an impressive lineup of premium features. It holds up to 4 mL of e-juice to minimize frequent refills, using a swivel fill port that keeps everything easy and spill-free. Thanks to SMOK’s innovative coil design, the Baby Beast delivers incredible flavor and vapor, intensifying the taste of his favorite e-juice to a new level of deliciousness. Customizable airflow offers a range of options, smartly designed for a smooth, satisfying draw every time. The Vandy Vape Iconic RDA is a collaborative effort with Mike Vapes, a name your man likely knows and respects. This rebuildable dripping atomizer is crafted for both performance and convenience, without leaving out style. With a 24 mm base, it’s just the right size for easy building, with a dual-clamp post setup that allows for complex builds. If your man enjoys squonking, the included squonk pin makes it simple to pair the Iconic with his favorite squonk mod. Excellent airflow, a large juice well, and high-impact durability round out this tank’s features worth noting. The Uwell Nunchaku is an eye-catching sub-ohm tank packed with performance-enhancing features. Holding up to 5 mL of vape juice, this top-filling tank delivers extended vape sessions that don’t require constant refills, while the dual-bottom airflow makes it easy to experiment with different intake levels. One of the Nunchaku’s most distinctive features is the chimney design and condensation chamber, working together to prevent messy juice leaks. Giant, flavorful clouds are the product of the Pro-FCOS Coil, a favorite coil with rave reviews. With a legacy of high performance and innovation, it’s no surprise that SMOK is making a second appearance on our list of top tanks. The TFV12 Prince is a premium option for sub-ohm vaping, offering a mind-blowing experience wrapped up in a stylish, high-end package. The standard juice capacity stands at a generous 5 mL, which your man can kick up to 8 mL with the convex glass capacity. Even so, the tank doesn’t look or feel bulky. Its V-12 Prince-T10 decuple coil heads are at the heart of the tank, fueling plenty of delicious, fluffy vapor clouds. With an advanced coil system that gives your man the option of working with four exquisite coils, the Horizon Falcon Sub Ohm tank offers a wealth of customization choices. Horizon has provided coil options to consider, with each one boasting its own impressive features and benefits. Filling up the tank will provide your guy with 5 mL of vape juice to enjoy, perfect for long vape sessions and all-day vaping. Shopping for a man that already has everything for his vaping hobby is doubly challenging – luckily, there’s always a new vape accessory to add to his collection. Help him stock up with all the vape necessities he wants and needs. Coil Master Skynet Prebuilt Coils are carefully engineered to provide the ultimate in flavor and vapor production and are often considered among the best pre-built coils on the vape market. Using advanced design techniques, Coil Master has created coils that are anything but ordinary, able to withstand the demands of even the most discerning vaper. Pure flavor quality means your man will be able to enjoy his e-juices as they were intended, whether he tends to lean towards the sweet or savory side of life. This pack includes 48 coils in a wide range of varieties, including fused Clapton, interlock Clapton, parallel Clapton, Super Tiger, and Tortuosity coils. Innokin is the ideal coil designer when it comes to user-friendly control and hassle-free customization. This five pack of 0.5ohm coils is a great option for a stocking stuffer or anytime gift, offering high-impact performance for an affordable price. The coils pair perfectly with the Innokin EZ TC Mod, allowing it to perform to its full potential of temperature control and variable wattage settings. Using a stainless-steel atomizer, the coils max out on both fresh flavor and satisfying cloud volume. Two mode options provide some flexibility for added customization. If your man has a DIY streak that would put MacGyver to shame – or just likes taking a hands-on approach to vaping – the Coil Master DIY Kit V3 will be right up his alley. Building your own coils is an enjoyable process for many vapers, but it requires a handful of special tools and supplies. With the Coil Master DIY Kit V3, he will have everything he needs to whip his coil wires into shape, including a handy place to store everything. Specialized tweezers and a T-style hex screwdriver allow for the ultimate in intricacy, and the included coil wire makes it easy to get started right away. You might not think a battery charger is the most exciting vape gift out there, but it’s one your man will love and appreciate nevertheless. Treat him to the Efest Lush Q8 8-Slot Intelligent Battery Charger, an intuitive charging system that offers a variety of configurations for fast, effective charging. The LCD screen provides constant updates on the batteries’ status, and the charger can work with a wide range of battery sizes and types. Bigger isn’t always better, especially when it comes to convenient, discreet vaping. The VaporFi MINI-CLEAR Clearomizer is a sleek, compact clearomizer option that gets the job done despite its petite size. It’s compatible with all VaporFi Express batteries, and replaces the standard cartridges to make it simple for your man to customize his vape juice blends for the ultimate flavor win. A premium-quality bundle that will save you money and make your man’s day? Look no further than the five great options below. If your man has a sweet tooth, the VaporFi Decadent Delight Vape Juice Bundle will surely satisfy every candy craving. VaporFi juice is rated among the best in the industry for both quality and flavor, utilizing premium ingredients and beautifully balanced blends. This bundle includes two giant-sized vape juice bottles, each one clocking in at 60 mL of decadent, dessert-inspired e-liquid. Bites Vanilla Caramel Swirl is reminiscent of an ice cream sundae topped with cream and caramel, while Raspberry Mocha combines tart berry notes with rich espresso and dark chocolate. Does your man’s morning routine include a mandatory cup (or two) of joe? If so, the VaporFi Coffee Lovers Vape Juice Bundle will push all the right flavor buttons. Two 60 mL vape juice bottles provide a generous supply of delicious e-liquid, keeping him well-supplied for all-day vaping. The bundle includes two of VaporFi’s most popular coffee-inspired juices, Raspberry Mocha and Catch Ya Latte. Espresso, dark chocolate, and raspberry come together for a delicious kick of flavor in Raspberry Mocha, while Catch Ya Latte captures all the flavor notes of his favorite caramel latte. Menthol might be considered one of the most traditional vape juice flavors out there, but today’s creative flavor blends have made it anything but boring. VaporFi’s Menthol Lovers Vape Juice Bundle includes a staggering 180 mL of e-liquid, broken down into three refreshing flavors in 60 mL bottles. Island Frost puts a tropical spin on menthol with the addition of coconut, pineapple, and other fruit flavors, Havana Beach blends deep tobacco and menthol flavors with sweet cream and coconut, and Slushie is a menthol-based creation with a bold twist of watermelon and colada. Knock your man’s socks off with this huge GRND RSRV Collector’s Edition Set, made up of 6 (60 mL) vape juice flavors in one gorgeously designed package. This premium juice line is famous for its intense flavor, working equally well for dripping, sub-ohm vaping, and other vape styles. Stock your man’s e-juice shelves with these GRND RSRV favorites, including Catch Ya Latte, Cloud Candy, Meringue O Tang, Island Frost, Pineapple Pow, and Rainbow Custard. Your manly man might not be caught dead with a tropical umbrella-topped drink in hand, but he can’t deny his love for the sweet taste of an island-inspired cocktail. The VaporFi Crazy Colada Vape Juice Bundle lets him vape away on the sweet, fruity flavors contained in the 2 (60 mL) bottles of e-liquid included. GRND RSRV Maui Menthol is sweet and refreshing, blending minty fresh notes with papaya, guava, honeydew, and jackfruit. Slushie is summer in a bottle, combining sweet colada with ripe berries and cooling watermelon flavors. Vape pens are ideal for the man who wants convenience and easy portability. These five vape pens are crafted by the best brands in the industry, guaranteeing an excellent vape experience every time he powers up. Master crafter SMOK has created a vape pen hit with the Stick X8, a compact pen-style vape with impressive power potential. The 3000mAh pen is powered by a built-in, internal battery that charges quickly and easily, so your guy can spend less time plugging in his vape pen and more time surrounded by fluffy, flavorful clouds. If you want to set him up for serious vaping satisfaction, snag the SMOK Stick X8 Vape Starter Kit, which includes the well-designed Baby Brother tank. If you’re looking for a vape gift that won’t break the bank, the Innokin Endura T20S is a great option. Despite its low price, this sleek and stylish vape pen doesn’t disappoint when it comes to performance – proof that good things really do come in small packages. Color options include classic stainless steel, deep red, smoky gray and more, so you can easily choose the one that fits your man’s style. The integrated 1500mAh battery is everything he needs for power and battery life, and easy charging keeps down time short and sweet. The SMOK Stick V8 Big Baby Beast has a name that instantly commands attention, and the power-packed performance to live up to all the hype. The vape pen’s conservative footprint makes it perfect for storing in a pocket or purse, and the lightweight construction fits comfortably in your hand – but is also super durable. Don’t underestimate the compact pen, because it’s fueled with 3000mAh of power to satisfy all your man’s vaping demands. The option to run with coils as low as 0.15ohm is a major plus of the SMOK Stick Big Baby Beast’s tank, which is included in the excellent starter kit. If your man is just starting out in the world of vaping, the SMOK Vape Pen 22 will provide him with an enjoyable journey along the learning curve. The Vape Pen 22 was strategically designed to provide a high-level experience with zero hassle, maximizing enjoyment for even the most novice of vapers. An internal tank and 1650mAh battery takes care of efficiency, while extensive safety features act as a great back-up for the learning vaper. If your man vaporizes dry herbs, he needs a specially-designed device to make the most of the experience. Get him all set up with a few of these great vape gifts that are perfect for the cannabis user. Perfectly pocket-sized, the VaporFi Atom Dry Herb Vaporizer delivers an unparalleled experience for dry herb enthusiasts. Smart features like a battery preservation sleep mode and motion sensing technology put this dry herb vaporizer head and shoulders above many of its competitors. The LED light interface is intuitively designed, and it’s simple to utilize the device’s three temperature control settings to optimize flavor and smoothness. Choose from a handful of stylish color options that perfectly complement the Atom’s clean lines and sleek shape. Every piece and part that factors into the VaporFi Orbit Dry Herb Vaporizer embodies clean, stylish design for a modern look that fits into your man’s personal style. The built-in 2200mAh battery is designed for extended, high-volume use, engineered with an impressively long lifespan. With an advanced heating chamber, the Orbit Dry Herb Vaporizer makes the refill process incredibly easy, speeding up the setup process so your man won’t have to waste any time. This seemingly simple, inexpensive tool will change the way your guy enjoys his dry herbs, making the prep process incredibly clean and easy. The VaporFi Dry Herb Grinder is constructed using aircraft-grade aluminum for the ultimate in durability, a smart design choice for a tool that will be used on a regular basis. The diamond cutting blades are razor sharp, while a stainless-steel pollen screen sorts out the finest grains for excellent potency. Set your man free from the smoke-filled hassle of his old-school ways with the VaporFi Air 2 Complete Mini Vaporizer Bundle. It comes equipped with everything he needs to enjoy the clean, flavorful vapor of his dry herb of choice, as well as a custom-blend vape juice to add a little variety into his vape routine. The compact vaporizer provides plenty of power with 350mAh of battery life, and the device’s smart design maximizes flavor and cloud volume. Looking for a budget-friendly vape gift that makes your man smile? The VaporFi Orbit Dry Herb Vaporizer Mouthpiece is a must for any dry herb enthusiast, designed with a versatile shape that provides excellent comfort. The advanced filter system provides clean, pure vapor down to the last puff, making the Orbit Mouthpiece something he’ll want to keep on hand at all times. When you’re shopping for gifts, odds are you have a few key priorities in mind: good prices, quality products, and customer service you can count on. Instead of wasting time and money with low-end vape retailers, stick with VaporFi for the best gifts for all the vapers in your life – at some of the best prices in the business. Our team is passionate about vaping and sharing it with our customers, which is why we’re committed to leading the industry in product quality, customer service, and competitive prices. You won’t find any cheaply-made products or knock offs here, so even if you aren’t vape-savvy, you can shop for vape gifts with confidence. We think it’s important that every vaper loves their vape setup and products, which is why we offer a 30-day money back guarantee. Buying a vape gift for a friend or family member is a whole lot easier when you know they have the option to exchange if it doesn’t fit their vape style. You’ll be crowned best gift giver at every birthday, holiday, and beyond when you choose VaporFi for all your vape gift needs.